Data takes on many forms. Sometimes, data can look like a synthetic life form on the USS Enterprise. Other times, like a gadget-wielding little boy in the Goonies. But more often than not, we envision data as long strings of integers that stretch out to infinity and come accompanied with the dial-up Internet noise. While data is integrated into nearly every facet of our lives, there still remains a disconnect between the numbers and how they’re presented. I mean, all a baseball pitcher really has to do is stand on a hill and throw to another player, but their stat sheets make it look like they’re coding the next Apollo mission at the same time. This is precisely why I take notice when a company is able to blend data and marketing so effortlessly, or at least make it seem that way. Here are some examples that showcase the versatility of data presentation when it comes to company branding. Recently unveiled in the U.S., the U.K., France, and Germany, Spotify has taken to the streets to announce some of the odd listening habits its users have engaged in during 2016. 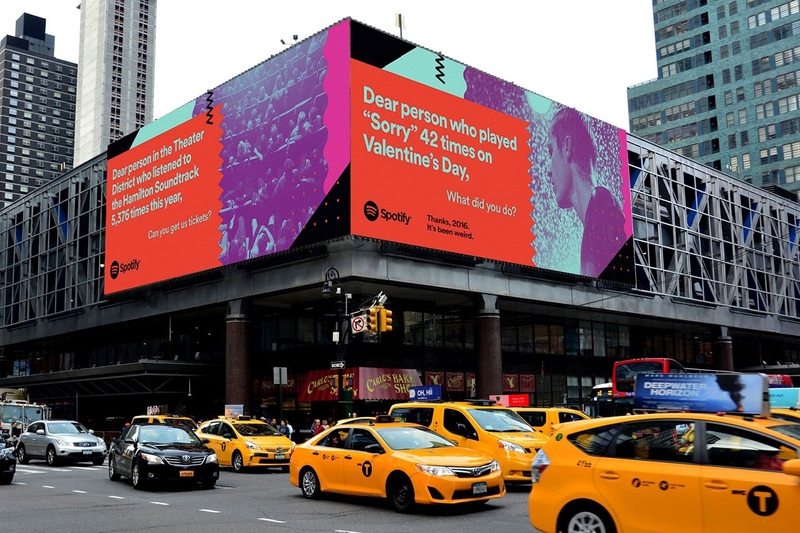 One listener, for example, has played the “Hamilton” soundtrack 5,376 times this year, a fact that Spotify made known through the placement of a large billboard in New York. Other billboards reference the play count of “It’s the End of the World as We Know It” the day of Brexit voting, and the poor sap who played “Sorry” 42 times on Valentine’s Day. It’s been said that music is the universal language, and while this new campaign from Spotify comes with the tagline, “Thanks, 2016. It’s been weird,” you can always count on someone listening to holiday music in the middle of the summer. On the surface, it really does seem unbelievable. A small child on an animated billboard is crawling around, when suddenly he rises to his feet, points to the sky at a passing plane, and then correctly identifies the flight and its destination. Is it magic? Yes. Well, no, but the real answer is just as cool. By attaching an antenna to a nearby building, data was pulled from the transponder of every passing British Airways plane, which included among other things, each plane’s call sign. The data was fed into a computer that could determine the plane’s destination, and then cross-referenced with a device that determined if weather conditions allowed the plane to be seen. The combination of this data and technology allowed the billboard to receive the data necessary for creating each ad that played, and netted agency OgilvyOne a slew of awards for their work. Magic of Flying Digital Case Study Movie from Benita on Vimeo. I have a confession to make. I’ll walk multiple city blocks (and potentially even pay a higher parking fee) if it means I don’t have to attempt parallel parking. While I give you some time to shake your head in disgust at me, check out the above video. Fiat setup an interactive billboard next to a space that requires parallel parking, and through the use of ultrasonic sensors and software created in-house, these billboards would display a person as your car approached. Then, said person would guide your car into the parking space by displaying your proximity to the car behind you, kind of like how a fisherman describes the length of his recent catch. While in limited usage, Fiat goes to show that marketing doesn’t have to be all about offers or deals, and that through the small act of parking assistance, everyone stands to gain something through data-driven marketing. “Big deal,” you type smugly in the comment section, “These ads are cool, but it’s not like I’m actually going to go invest in their product now.” And you know what? Good ads sell products, but great ads leave an impression, which is exactly what this trio accomplishes. I’ll likely never see the British Airways ad in person, but just this past weekend I was telling my friend about it as if I saw it all the same. Herein lies the beauty of presenting data as a marketing tool: it’s a win-win. Each company gets to advertise their product in large, public spaces, while simultaneously providing a unique and sometimes even helpful approach to the world around us. Sometimes the best thing an ad can persuade you to invest in is a conversation, which is exactly what data-driven marketing is able to accomplish. Error - Error validating access token: Session has expired on Tuesday, 06-Feb-18 09:00:00 PST. The current time is Friday, 19-Apr-19 17:13:45 PDT.